The Rolling Machine is a Railcraft machine used for stamping out various metal items. It requires power in form of MJ. The rolling machine uses MJ as a power source. Isolate it from your BuildCraft (MJ) power grid and run it with its own dedicated engine. Destroy the power conduit that attaches it to your grid when not in use. NOTE: With TE's Redstone Energy Conduit you can use a wrench or Crescent Hammer to toggle the connecting conduit to input mode to stop it from draining power. 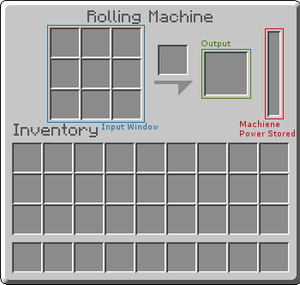 Attaching a dedicated Redstone Engine to the rolling machine may keep it topped off when detached from your power grid but will not stop it from drawing some power while attached. More powerful engines (tested with 4 combustion engines) did not eliminate the draw. Using the above 2 methods in combination seems to work. The Redstone Engine keeps the rolling machine charged up when idle and wrenching the Redstone Energy Conduit to input mode effectively disconnects it from the power network. The rolling machine works similarly to a crafting table. It will automatically draw power and use it to craft the items in the left-hand grid unless it can only produce a single item with the ingredients it has in stock. In that case, it will wait for the player to click the image between the crafting table and the output slot before beginning to work. This page was last modified on 23 May 2018, at 11:45.